The General Transit Feed Specification (GTFS) is a standardized data format for storing public transit routes, stops, and schedules. GTFS data can be used for transit trip planning and public transit system analysis. Thousands of public transit agencies worldwide have made up-to-date GTFS data for their systems publically available for download. The tools and techniques here allow you to use GTFS data in ArcGIS. Use Add GTFS to a Network Dataset to incorporate transit data into a network dataset so you can perform schedule-aware analyses using the Network Analyst tools in ArcMap. 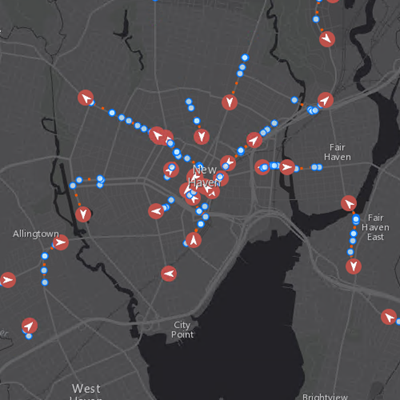 Use BetterBusBuffers to map the frequency of public transit service available across your city. Use the GTFS conversion tools in ArcGIS Pro to visualize your GTFS stops and route shapes in a map and update your GTFS stops.txt file. The Generate GTFS Shapes toolbox produces a new shapes.txt file for your GTFS dataset or allows you to edit an existing one. Use Interpolate Blank Stop Times to fill in blank arrival_time and departure_time values in your stop_times.txt file with reasonable estimates. Use the GTFS Realtime Connector for GeoEvent to view GTFS Realtime trip updates, service alerts, and vehicle positions in a map. Use Display GTFS in ArcGIS to visualize your GTFS stops and route shapes in ArcMap. Use Edit GTFS Stop Locations to update your GTFS stops.txt file using ArcMap. Please post them to our GeoNet group.